Make your summer unforgettable! Come spend a unique week fully immersed in creative media production. Whether in acting, animation, film production, writing, makeup, or video game development, you'll work with industry-leading teachers and mentors living and working the dream. This is your chance to experience firsthand what life is like inside VFS and what our programs offer. Price varies per workshop - see specific workshops below for prices. Our 1-week long Summer Intensives run from July 8th, 2019 to August 2nd, 2019. 9 a.m. to 4 p.m. each day. 8:30 a.m. on the first day. See your schedule for location. **Students must confirm they are at least 16 years old at the beginning of the workshop in order to register. We’re continually improving our curriculum to enhance your experience at VFS. Please note that the content below may be subject to minor curriculum changes. Get $50 off when you take two or more intensives. Apply to a full-time VFS program within 24 months of taking a Summer Intensive and 50% of the cost of up to two intensives will be applied to your full-time tuition upon enrollment. In this five-day program, you'll get a comprehensive introduction to the key facets of filmmaking as you take a project from script to screen. Alternating between lectures and hands-on production, you'll bring a compelling story to life through the major areas of screenwriting, directing, cinematography, production design and post production. You'll learn about creating and writing short scripts, working with actors, and the inner workings of a film set. In a collaborative environment, you'll attend production meetings, get on-set shooting experience while working within state-of-the-art production studios, all while working closely with actors to create and shoot a short scene. The week culminates in a festival style screening with an industry panel. Note: This five-day Summer Intensive is available during two different weeks. Students should choose to register for Session 1 or Session 2. On the Wednesday of each week, students should expect to stay until 7pm as it's a filming day. Sorry, this workshop is now sold out. 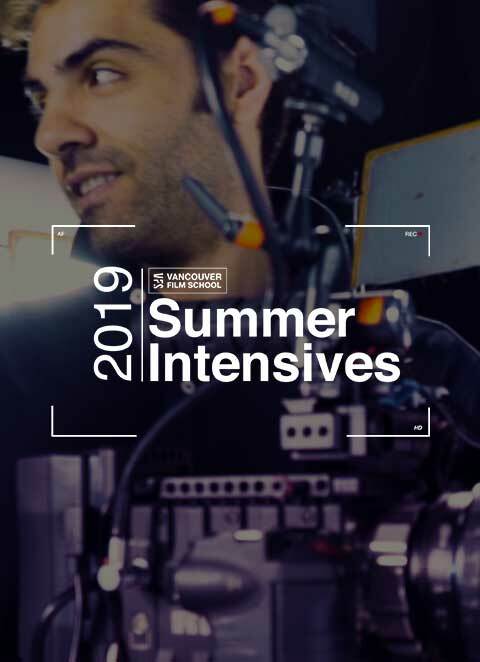 In this comprehensive five-day Summer Intensive, you'll be introduced to the world of acting for film and TV, from the basics of using your voice and body freely as an instrument of play, to a deeper understanding of a script, to studying scenes. You'll also learn how an actor interacts on a film set as well as vital audition techniques. Your week will culminate in filming a scene that synthesizes your work in front of the camera. Join us to explore the serious play in training for actors. Note: This five-day Summer Intensive is available during two different weeks. Students should choose to register for Session 1 or Session 2. Sorry, July 22-26, 2019 session is now sold out. This five-day Summer Intensive takes a hands-on approach to arts education with modern visual media technologies. You will explore fundamental skills such as digital filmmaking, 2D design and Sound Design as well as how various media arts disciplines intersect to deliver powerful creative experiences. You will create a small movie project combining all of these diverse but converging areas to help you understand where you are headed in the future. Led by our faculty, each class has a hands-on component that contributes to the development of your artistic practice. This course is tailor-made for those who are passionate about the entertainment arts but have yet to decide on their industry path. This Summer Intensive features five days of exploring the processes, history, and potential of animation. You will get hands-on experience with techniques used in designing for animation, including exercises that form the foundation of the entire medium. You'll learn pose and form while creating a 3D model and exploring cutting-edge 3D tools to animate objects. The program will also introduce you to basic visual effects concepts and software as well as creating concept art like storyboards and character designs - leaving you with vital insights into the workings of the real-world animation & visual effects industry and the variety of exciting roles artists play within a production. In this five-day Summer Intensive, you'll discover the essential components of successful screenwriting through lectures, workshops, and writing assignments. Guided by working screenwriters, you'll learn about character, dialogue, story, the entertainment business, pitching, selling, and script analysis - exploring how these elements combine in effective stories and career paths. By the end of the week, you'll have completed your own short film script. On the final day, you'll see your words come to life when trained actors perform each script in a cold reading. Designed for those who want to know what a career in the game industry looks like, these five days will give you a one-of-a-kind opportunity to experience the dynamic role of a game designer. Explore the game development process from concept to completion and get hands-on experience in game art, level design, storytelling, and programming software. Come prepared to bring characters to life in Unity and explore 2D gaming by prototyping your very own online game. At the end of the week, you walk away with a better understanding of the full-time Game Design program at VFS and the beginnings of a dynamic portfolio. This five-day Summer Intensive will introduce you to many facets of makeup. Through live demonstrations and hands-on work, you'll cover basic highlight and shadow techniques as well as corrective and beauty principles also applicable to character makeup. You'll try "out-of-kit" effects like cuts and scars, as well as facial hair applications. On the final day, you'll design and apply a tattoo and come away with photographs of your finished creations from the course. Questions about VFS Summer Intensives?